TBILISI, DFWatch–Conservative groups continued protesting against KaZantip Wednesday as the music festival opened at 9 pm in the evening. Those opposed to the festival are radical Orthodox Christians and small opposition parties. 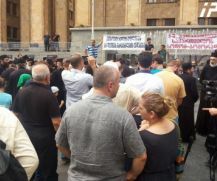 On Wednesday one such group held a protest rally in front of the old parliament building in Tbilisi. One young girl turned up at the protest to defend KaZantip. She said she often attends this kind of festivals in Europe and people are never protesting against it there. The anti-KaZantip demonstrators called her a provocateur and demanded that she leave. Yesterday, clerics conducted a prayer near the festival site in Anaklia, a sea resort in Georgia. They plan to continue demonstrating prayers in the street every day until festival is over. It runs from August 20 to August 30. Clerics also want from government to expel Nikita Marshunok, the main organizer of the festival, from Georgia. Bishop Davit kvlividze told journalists on Wednesday that the country cannot move forward by bringing 12,000 prostitutes here and the economy cannot count only on that. “This is a man who insults our traditions. He laughs at us,” he said referring to Marshunok.